How Far is Navaneetham Apartment? Navaneetham Apartment is one of the popular residential developments in Medavakkam, neighborhood of Chennai. It is among the completed projects of its Builder. It has lavish yet thoughtfully designed residences in 1 Blocks. I.Structure : R.C.C framed structure with RCC columns, beams and Slabs. Brick Masonry filler walls, CCP with Ground Plus two Floor. Earth quake resistant design.. Doors and windows : Main entrance door will be of first class Teak both frames and shutters.Bathroom door will be of water proof fibre material.Bedroom doors and other doors will be compressed wood panel doors. II.Flooring : Drawing,Dining room & Other rooms will be of vitrified tiles. Kitchen : Kitchen platform will be of high grade polished granite top, stainless steel kitchen sink with drain board and dado about 2’ 0'' height above the platform. 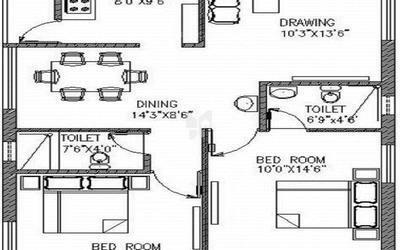 Loft will be provided as per drawing. Suitable opening for exhaust fan will be provided. III.Toilets : Anti skid Ceramic tiles flooring, ceramic tile dado till lentel level. Concealed plumbing arrangements,conceeled PVC pipe line of slow guard make for hot water pipe line(cpvc). IV.Sanitary wares & fixtures : Parryware gloss set,Bathroom fittings-Parryware. Electrical : connection with manual change over facility and concealed copper wiring, points for telephone, TV, fridge, washing machine, grinder, A/C, fan and light points in rooms. Provision for inverter. McB/ELCB (Earth Leak circuit breaker),automatic borewell motor controller. V.Painting : Brilla putti will be applied on the walls of flats to have smooth surface and finally finished with one coat of acrylic primer and 2 coats of emulsion. The external walls of the complex will be initially applied 1 coat of white cement,1 coats of primer and 2 coats of exterior emulsion. Doors other than entrance door with enamel paint. Entrance door with varnish (sealer finish)/melamine finish. M.S. Grill with one coat of primer and two coats of enamel paint. VI.Stair case steps & Landing area : Eurocon tiles or sabha stone. 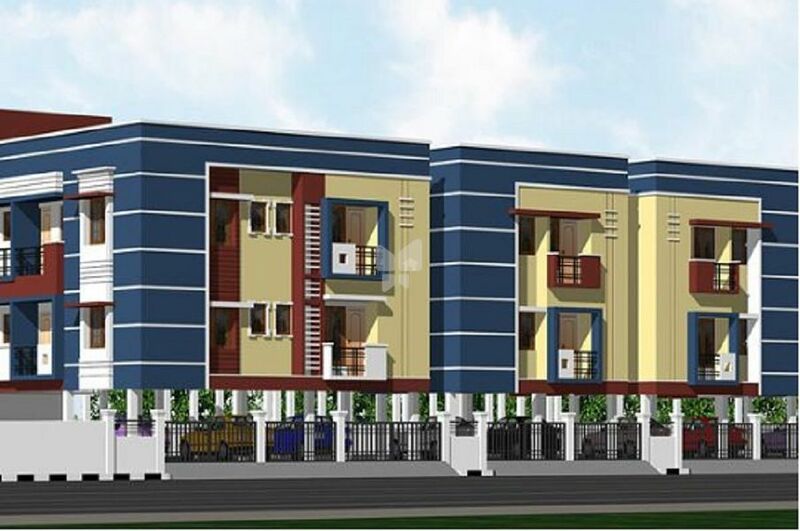 Special amenities : Front Elevation, Name Plates, Separate provision for electric meters in the main board, seperate provision for common electric meter for common service and sub main board in each flat for quick isolation of supply., covered parking space for vehicles, Rainwater harvesting. Entrance : One bell point and one light point. Drawing : One TV point, one telephone point, two light points in walls, two 5/5 A pin points,and fan points at suitable places. Dining : One 15A for fridge, two light points in wall, one 5A pinpoint. Fan points at suitable places. Master Bedroom : Two light points in wall, two 5A pin points, one 20A point for A/C, one TV point and one telephone point. Fan points at suitable location. Fan and light points to be 2-way. Other Bedrooms : Two light points in wall, two 5A pin points, one 20A point for A/C, one TV point and one telephone point. Fan points at suitable location. Fan and light points to be 2-way.. Attached Toilets : One light point, one light point over wash basin mirror, one 5A pin point and 15A point for geyser. Common toilet & wash basin : One light point, one light point over wash basin mirror, one 5A pin point and 15A point for geyser. Service : One 5A pin point, one light point and one 15A point for washing machine. Common points : Common light point in stairs & terrace, two numbers in compound wall, points for pump motor sets as per promoters choice. Switches : All switches shall be modular type. Our parent company Sumangali Transport & Earth Movers was established in the year 1986.We are responsible in creating many residential and commercial projects like marriage halls, residential apartments & shopping complex in the southern parts of chennai. Based on the vast experience we got from the past we decided to cater the needs of the individual who looks for the dream home to be built in high ethical standards. Building on a family heritage that spans more than a decade, we will continue to be privately owned by active management and guided by firmly held values. Sustainability. We plan and act for the future for the long-term good of our customers, our company,and our world.